Expect sensors to be a highly disruptive force for change in business models and processes in the coming years as leaders seek to improve peoples' lives. In an age of frugal consumption, sensors will reduce costs, improve knowledge and cut out many middlemen in the supply chain. Contact us to learn how we can expand this alert into a customized report. There will be close to a trillion sensors sending data over the web. Sensors and new applications will generate exponential growth in data. Sensors based on microelectro-mechanical-systems (MEMS) technology will continue to play a significant role in enabling Internet of Things applications. By the next decade, China will have deployed not only the PGMs but also extended-range sensors and communications, including space based, to give it the capability to make the western Pacific inhospitable for U.S. ships and bases. Simulations will be based on global data gathered by sensors and collected from continuous monitoring and analysis of networks, businesses, customers. Web-connected objects will be able to transmit and receive information on a massive scale and potentially adapt and react automatically to changes in the environment. Tiny sensors will be integrated in buildings and bridges to immediately report a crack or other structure failure. Sensors will detect a range of data to communicate to wearables-dangerous chemicals, oxygen levels, and hazardous emissions. AHS systems will save at least 50% on fuel efficiency by converting stop and go to relatively continuous driving. Machinery beyond premium cars will actively send performance metrics back to manufacturers. Cars will be able to use internal cameras and sensors to automatically identify drivers. Equipping cars with a wider array of sensors, as well as embedding sensors into the environment, will help in poor driving environments. Algorithms are combined with the sensors to show autonomous vehicles the location of vehicles and pedestrians predict where they are likely to move and take avoidance measures if necessary. Real-time data from sensors and devices will continue to transform the commercial insurance business model. The commoditization of sensors will open up new avenues to access underserved populations and provide them with better health care. Specially installed sensors will monitor people's health and transmit their findings into a cloud-based storage that can be accessed by the local doctor. Electronics and sensors that relay information from inside jet engines and deep oil and gas wells could improve efficiency and save millions of dollars. Technology transfer to sensing robotics will be of great benefit particularly in composites, light metal foams, and materials integrating functionality such as sensing and actuation. Utilities, home owners, and manufacturing facilities will increasingly look to distributed generation technologies (solar sensors etc.) to meet their electricity needs. Real impact will come from combining data and relevant sensors, things, and people so lives can be lived better. Most new data will be generated not by people but by sensors and embedded intelligence. New artificial intelligence knowledge-management tools will enable the generation of powerful new insights and identify emergent trends and patterns. Web-connected objects will be able to transmit and receive information on a massive scale. Machinery will actively send performance metrics back to manufacturers. Wearables, embedded sensors, and connected devices will have inherent internal and external dependencies in underlying data and services. Different devices from different manufacturers will all be able to "talk" to each other. Major emphasis will be put on the integration of real-world devices across all communication layers. The use of big data will become a key basis of competition and growth for individual firms. Cities will be aware of real-time traffic conditions and accidents based on sensor data from fixed and human sensors through services like Waze. Transit systems could also be used as probes to collect information on traffic and roadway conditions for local and regional transportation agencies. Non-invasive sensors and mobility could provide fast, accurate and objective data on the state of farms and vineyards. Increasing levels of automatic control will lead to full automation over time. Greater economies of scale will bring costs down. The technical profile of trades and crafts jobs will increase. Digitalised tools such as sensors will require new skills in order to be used effectively. 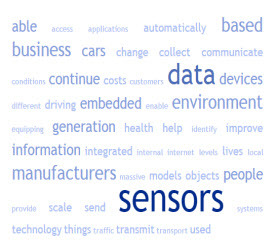 To find the sources and more resources on Shaping Tomorrow about the future of sensors some of which were used in this Trend Alert. View Sensor Explosion Coming Soon.